Bollywood 'Queen' Kangana Ranaut celebrated International Yoga Day in London, where she is shooting for her upcoming movie 'Mental Hai Kya', with Rajkumar Rao. 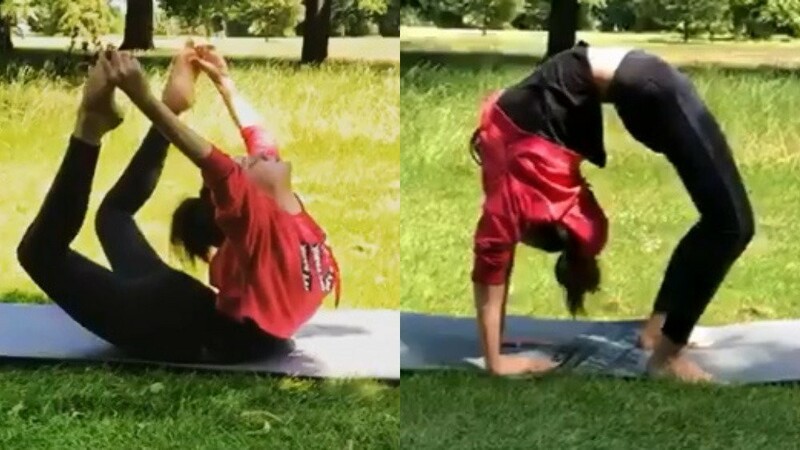 The 'Rangoon' star shared photos and videos of her performing yoga at London's Hyde Park. The official Instagram account of the actress' team shared the image, writing, "#KanganaRanaut shows her dedication towards #Yoga on #InternationalYogaDay2018 & encourages everyone to adopt Yoga as a lifestyle & a way to spiritual awakening. #YogaDay2018 #WorldYogaDay #internationalyogaday." She also posted a video and wrote, "The very heart of Yoga practice is 'Abhyaasa'- Steady effort in the direction you want to go to. On the work front, Kangana will also be seen in 'Manikarnika: The Queen of Jhansi', based on the life of Rani Laxmi Bai. The film also stars Sonu Sood, Suresh Oberoi and Ankita Lokhande.